These Angelic creations were divinely inspired by five Archangels in particular: Michael, Raphael, Gabriel, Uriel and Metatron. I am eternally grateful to these Angels, who have provided me with Divine Intervention ... and miracles! They have remained trusted Guardians and friends, always at my side ... gracing me with their Divine Inspiration. 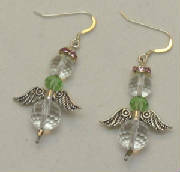 Each Angelic creation (Necklaces, Bracelets, Earrings, Window Jewelry, and Bookmark/Pendulum) is specifically designed to reflect the vibration of each Angel's Aura Color. 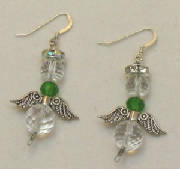 Archangel Raphael: emerald green. Michael: Royal Purple. Gabriel: Copper. Uriel: Pale Yellow. Metatron: Pink & Green. 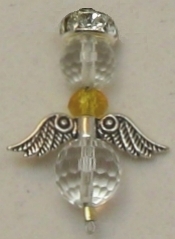 The Angel's head and body are made from genuine Clear Quartz Crystals. 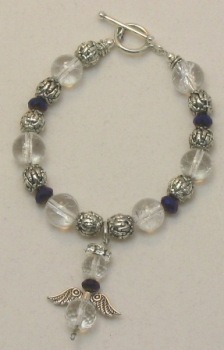 Aura Angel Window Jewelry also includes a semi-precious gemstone ascribed to each Archangel Michael: Sugilite. Raphael: Malachite. Gabriel: Citrine. Uriel: Amber. Metatron: Watermelon Tourmaline. Adorn yourself and your home with this beautiful Aura Angel jewelry ... and take a moment to reflect on its personal meaning to you. Let the Angel's healing presence flood your heart and life with their Healing, Love, Light, Protection, and Divine Inspiration! Related Crystal: Sugilite ... Spiritual Protection & Purification, Becoming a "Beacon of Light". Associated Astrological Sign: Archangel Michael Oversees everyone and all signs. Prayer: "Dear Archangel Michael: Please keep me, my home, vehicle, possessions, loved ones, and everyone around me, safe. Clear my energy, keep me peaceful & trusting, & guide me on my life's purpose. I welcome your help in keeping all of my appliances and electronic items running perfectly. And for this I am Eternally Grateful! Thank you, Amen." Specialties: Heals Physical Illness of Humans & Animals, Helps Guide Those Dedicated to Field of Health & Wellness, Aids Those Traveling for Harmonious & Safe Journeys. Malachite: Enlightened Leadership, Creativity, Confidence, Protection, a Healed Heart. Associated Astrological Sign: Archangel Raphael oversees everyone and all signs. Prayer: "Dear Archangel Raphael: Please keep me in perfect health, and heal any and all of my dis-eased conditions and illnesses, as well as those of my loved ones and pets. Guide me on my path to health and wellness, and in my ability to help others. Keep me blessed, safe and jovial during all of my travels. And for this I am Eternally Grateful! Thank you, Amen." 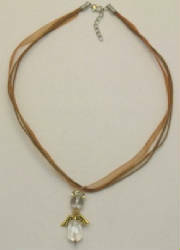 Citrine: Manifestation, Personal Will, Mental Clarity, Creativity. Associated Astrological Sign: Cancer. The nurturing and hardworking parent. Prayer: "Dear Archangel Gabriel: Please guide me in all of my communications, be they written, spoken, or thought, so that they may only embody sentiments that are loving and appropriate. Also bring to me those communications that are blessed and loving. [Include your own prayers should you require help with pregnancy & adoption issues, or health issues with pets.] And for this I am Eternally Grateful! Thank you, Amen." 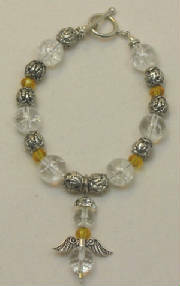 Amber: Light, Warmth, Solar Energies, Clarification, Healing. Associated Astrological Sign: Aquarius. The thinker and analyzer. Prayer: "Dear Archangel Uriel: Please pour your healing light into my troubling situations [list them if you'd like] and help me easily, clearly and immediately become intuitive and create perfect solutions. Fill me with your loving light and guide me in healing any resentments, and provide me with a feeling of total forgiveness and completion. Please guide me in all of my intellectual endeavors. And for this I am Eternally Grateful! Thank you, Amen." Associated Astrological Sign: Virgo. The hardworking, industrious, inventive, curious, serious perfectionist. Prayer: "Dear Archangel Metatron: Please shed your beautiful light on me and my spiritual journeys, providing me with courage, passion and confidence. Help me continue to raise my vibrational frequency in my own personal ascension process and tha tof Mother Earth. Guide all of the youngsters in my life and in the world so that they quickly and joyously embark upon their own spiritual paths. And for this I am Eternally Grateful! Thank you, Amen."